ABCO Automation provides custom factory automation solutions and build to print services to manufacturers worldwide. Custom design, high quality, and unrivaled client services are at the forefront of the company’s philosophy. ABCO combines extensive machine design knowledge and unmatched technical expertise to design, build, and install the most cost-effective solutions that provide our clients with unparalleled efficiencies. It is our commitment to quality and our ability to design and build virtually anything in-house that makes ABCO the ideal strategic partner for premier manufacturers worldwide. The design team at ABCO Automation is a select group of talented and proven people, including mechanical and electrical engineers, machining and fabrication specialists, mechanics, and electricians who work closely together to provide top-notch automation solutions for a wide range of manufacturing industries. ABCO Automation excels at designing and building custom automation machinery for a variety of industries. These custom solutions result in increased productivity and a better competitive advantage in the marketplace. From stand-alone machines to integrated manufacturing processes, ABCO delivers high-performance systems that keep manufacturers operating effectively. ABCO’s Engineering Team works with its clients through all steps of the design process, combining the client’s product knowledge with ABCO’s automation capabilities, to design the best systems possible. ABCO’s manufacturing groups bring the engineering designs to life with uncompromised quality and craftsmanship. ABCO’s specialized in-house quality lab ensures that the work produced meets or exceeds industry standards. Satisfying client requirements is essential to ABCO’s continued success. Our processes start with determining the client’s requirements and end with a review to verify that the requirements have been fully met. Everyone involved with providing products or services to our clients is responsible for ensuring that the client requirements are well-defined, well-documented, and the final products or services meet the specified requirements. ABCO’s Quality Policy: Sustain profitable growth by providing a variety of automation and technical services that meet or exceed our clients’ requirements. ABCO is 100 percent committed to client satisfaction and profitable operations through continual improvement and employee ownership. We hold ourselves to ever-increasing standards of excellence in everything we do. Client focus: understand current and future client needs, meet client requirements, and exceed client expectations. Leadership: establish unity of purpose and direction of the organization; create and maintain the internal environment in which people become fully involved in achieving the organization’s objectives. Involvement of people: people, not machines, make quality a reality. When vision, objectives, and plans are shared, everyone will be working together to benefit the organization and the client. Process approach: the desired result is achieved more efficiently when activities and related resources are managed as a process. System approach to management: identifying, understanding, and managing interrelated processes as a system contributes to the organization’s effectiveness in achieving its objectives. Continual improvement: to achieve excellence, never settle for the status quo, and always continue to improve. Mutually beneficial supplier relationships: an organization and its suppliers are interdependent and a mutually beneficial partnership enhances the ability of both to create value. 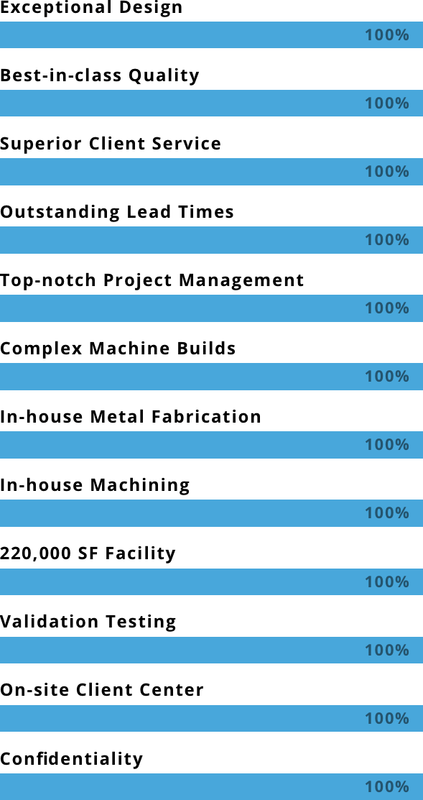 Every design build project at ABCO Automation is led by one of our many dedicated project managers using standardized processes based on PMI best practices. An ABCO project manager begins by clarifying and aligning the project's key objectives and deliverables with the client’s business and stakeholders. The project manager manages all phases of the project feasibility, concept, design, construction, and start-up through successful completion. Our project management team makes every effort to keep projects on schedule. Using Microsoft Project, project managers create and share with clients a detailed production schedule. Communication of project statuses are typically tailored to each client’s requirements but may include design review documentation, monthly progress reports, milestone updates, and weekly updates. Project managers customize the system installation plan to each client/project, depending on each client’s specific requirements. ABCO supports each automation system during the installation and start-up phase on the client’s site. Clients are provided thorough documentation and training to maintain their automation system. ABCO continues to provide support as needed for the life of the system to maintain high operating efficiencies. Check out ABCO Automation's galleries and browse through photos and videos of systems that we have produced.